Is the OnePlus 5 a worthy upgrade? The OnePlus 3T is a great phone, but ultimately it’s just a refinement of the OnePlus 3 rather than a true generational upgrade. Despite launching less than a year later the new number in the OnePlus 5’s name suggests it has loftier ambitions, but can it deliver on them? We’ve put the OnePlus 5 and the OnePlus 3T head to head to show you just how much has changed and whether the OnePlus 5 is worthy of its numerical upgrade or whether it’s just further polishing what’s gone before. 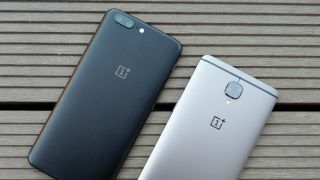 We’ll also compare the prices – OnePlus handsets have always appealed in part because they’re so much cheaper than rival flagships, but is that still the case with the latest model? OnePlus has changed up the design for the OnePlus 5. It still has a metal unibody like the OnePlus 3T, but the edges and corners are more rounded with the aim of making it more comfortable to hold, and the antenna bands curve up around the top and bottom edges, making them slightly less visible than the bands on the 3T that cut straight across the back. The OnePlus 5 is ever so slightly slimmer and lighter, yet longer and wider at 154.2 x 74.1 x 7.25mm and 153g, where the OnePlus 3T is 152.7 x 74.7 x 7.4mm and 158g. The front of the OnePlus 5 looks similar to the 3T, with both sporting an oblong home button (doubling as a fingerprint scanner) below the display, but the back is a bit different. Beyond the changes in antenna bands, the OnePlus 5’s camera has also been shifted off to the side, while it’s more central on the OnePlus 3T, but it sticks out slightly on both phones. The OnePlus 5 comes in a slightly smaller selection of colors than the OnePlus 3T, with just Midnight Black and Slate Gray shades available, while the 3T comes in Gunmetal, Soft Gold and Midnight Black. There’s no significant change here, as despite most flagship phones moving on to QHD screens the OnePlus 5 has stuck with a 5.5-inch 1080 x 1920 one, just like the OnePlus 3T before it. Both phones have a pixel density of 401 pixels per inch and both use AMOLED technology rather than the more common LCD. Despite the relatively low resolution we were moderately impressed with the OnePlus 3T’s screen, as it delivered bright, vibrant visuals, and we’d expect the same from the OnePlus 5. One area where OnePlus phones are rarely lacking is power, and that continues to be the case on both the OnePlus 5 and OnePlus 3T. The 3T has a quad-core Snapdragon 821 chipset, which was among the most powerful mobile chips of 2016, and it pairs that with 6GB of RAM, which is more than most flagships have even now. But the OnePlus 5 goes even further, with an octa-core Snapdragon 835 chipset (the same as you’ll find in the likes of the HTC U11 and Sony Xperia XZ Premium) coupled with up to a monstrous 8GB of RAM (a 6GB of RAM model is also available). Don’t read too much into that, since if anything 8GB of RAM is overkill and may not translate into a tangible performance boost, but on paper at least the OnePlus 5 is one of the most powerful phones around, and even the OnePlus 3T still ranks high for power. There’s little difference in operating system, with both phones running Android overlaid with OxygenOS. However, OnePlus has added some new features with the 5, such as a reading mode and new gesture controls. The OnePlus 5 also ships with Android 7.1.1, and while the OnePlus 3T is upgradeable to that same version it’s likely that the OnePlus 5 will be supported with software updates for longer. The camera is the area of the OnePlus 5 that’s perhaps had the most attention, as while the OnePlus 3T has solid 16MP snappers on both the front and back, the OnePlus 5 adds a second rear lens, pairing a 16MP one with a 20MP telephoto one. The two lenses can be combined to create a bokeh effect in images, with blurred backgrounds while keeping the foreground in focus, or you can use them for optical zoom. And even on its own the 16MP snapper on the OnePlus 5 is an improvement on the OnePlus 3T’s, as it has an f/1.7 aperture where the 3T is f/2.0. That allows the OnePlus 5 to capture 34% more light, which should especially improve its low-light performance. Image stabilization is supposedly better on the OnePlus 5 too and it can autofocus up to 40% faster. The OnePlus 5 also has a 16MP front-facing camera, just like the OnePlus 3T. As for battery, that’s actually shrunk slightly, from 3,400mAh in the OnePlus 3T to 3,300mAh in the OnePlus 5. Yet OnePlus claims that thanks to hardware and software optimizations the OnePlus 5 actually lasts 20% longer than the OnePlus 3T – a claim we’ll be sure to put to the test in our full review. Both handsets support Dash Charge, so you can juice them up quickly. The OnePlus 3T isn’t actually on sale any more, but when it was it cost $439/£399 (around AU$580) for 64GB of storage and $479/£439 (around AU$630) for 128GB. That’s up from the price of the OnePlus 3, and the price has grown even more for the OnePlus 5, with this phone retailing for $479/£449 (around AU$630) if you want 64GB of storage and $539/£499 (around AU$710) for 128GB. That still undercuts big name flagships like the Samsung Galaxy S8, but OnePlus phones are no longer the bargain option they once were. Although little has changed on the screen, almost every other aspect of the OnePlus 5 has been upgraded – including the price. OnePlus is gradually edging away from its affordable flagship roots, but with a dual-lens camera, a refined build, a mammoth quantity of RAM, a supposedly longer lasting battery and one of the fastest mobile chipsets of 2017 there’s no denying there’s a lot of tech on offer here. That said, the OnePlus 3T still excels in most ways and is cheaper too, if you can still find it anywhere, and as good as the OnePlus 5 sounds on paper we won’t know for sure how well its specs list comes together until we’ve put it through a full review.